“The higher oil price environment may, if they stay around this level, also have an impact…put some downward pressure under demand growth,” Birol said. The warning follows the release of IEA’s latest Oil Market Report, in which the authority kept its oil demand growth projections for this year unchanged at 1.4 million bpd. “So it will not be a surprise if we are to revise our demand numbers in the next edition of the oil market report if the prices remain at these levels,” he told S&P Global Platts. India relies on exports for more than 80 percent of its oil consumption and China is more dependent on imports than it would like to be. So, it is no wonder that the climb in prices “will definitely hurt oil demand if it soared especially in the important demand growth centers such as India,” according to Birol. The the number of active oil and gas rigs rose by 19 after two weeks of big losses in the United States this week according to Baker Hughes, in a sign that US production is still set for increases. The total number of active oil and gas drilling rigs rose by 20 rigs­ according to the report with the number of active oil rigs gaining 15 to reach 831 and the number of gas rigs gaining 4 to reach 194. The oil and gas rig count is now just 22 up from this time last year, with oil seeing just a 23-rig increase year on year, gas rigs holding flat, and miscellaneous rigs seeing a 1-rig decrease for the year. Oil prices were trading up earlier on Friday leading up to the data release as early figures came in for OPEC’s March oil production from S&P Platts, which showed that its oil production had fallen by 570,000 barrels per day from February levels as Venezuela and Saudi Arabia saw steep declines in production levels. WTI was trading up $0.49 (+0.79%) at $62.59—well above the psychologically important $60 per barrel mark. The Brent benchmark was trading up $0.48 (+0.69%) at $69.88 at 12:18pm EST, after easing off the $70 per barrel mark earlier this week. Prices for both represent a significant gain week on week. Related: Is This The End Of Colorado’s Shale Boom? Despite the drop off in the number of active rigs, US crude oil production for week ending March 29 was 12.2 million barrels—another new all-time high. Unlike in the United States, Canada saw a decline in the number of active rigs this week. President Trump isn’t going to like this. Offering the first indication that the OPEC+ cartel of major oil exporters intends to extend cuts, Saudi Arabia has reportedly told its clients that they will receive significantly less oil than they had requested in April, extending deeper-than-agreed oil production cuts into a second month, Bloomberg reported. The report, which provoked a spike in oil prices, suggests that “Riyadh is determined to regain control of the oil market as prices remain well below the level that many OPEC members need to cover their government spending.” Oil rose as much as 1% on the news, before fading some gains. Aramco, Saudi’s state-owned oil producer, has given customers their allocations for the next month, and they’re some 635,000 barrels short of what refiners had asked for. 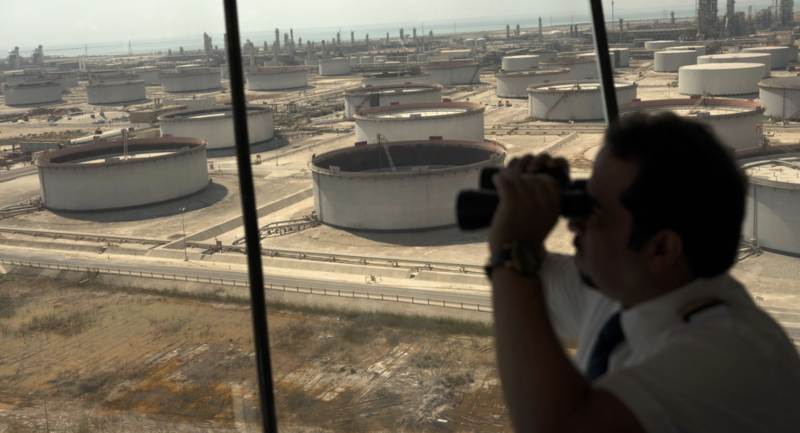 With Venezuela output falling further due to U.S. sanctions and power blackouts, oil refiners put in requests – or nominations in industry jargon – for Saudi crude of more than 7.6 million barrels a day for April, the person said. However, the kingdom will supply overseas customers with less than 7 million barrels a day, 635,000 barrels less than refiners asked for however, they said. The second consecutive month of deep production cuts shows the world’s largest oil exporter is determined to re-balance the market more quickly even though events in Venezuela have left some refiners short of crude. The crisis has worsened a deficit of so-called heavy-sour crude that many refiners use to make diesel. Rather than ‘a short-term correction in a structural bull market’, or a ‘temporary turmoil in healthy economic conditions’, this is the beginning of a structural adjustment after a decade of liquidity abundance and market manipulation, which reflexively changed the structure itself of the market for private investors in hazardous ways, making it insensitive to fundamentals, passive or quasi-passive, overly-correlated and overly-concentrated. Volatility is here to stay — and the political and economic implications will touch us all. 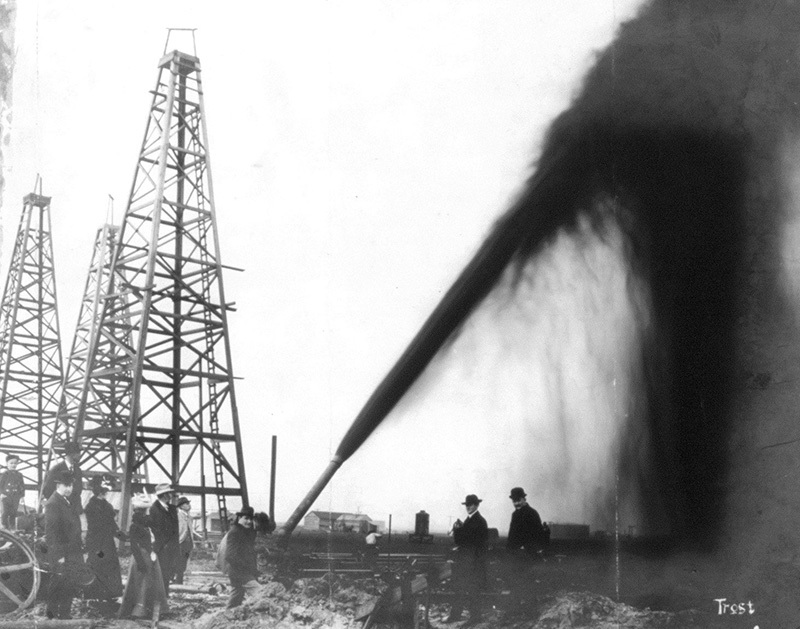 Oil once gushed from the ground for drillers, like these workers in Port Arthur, Texas, in 1901. Now costly fracking and oilsands mining produces lower-quality oil at far higher costs. Photo: US Library of Congress. Refineries in Japan and Korea, for example, scooped up cheap U.S. oil earlier this year. Last week the price of West Texas Intermediate (WTI) crude oil, the primary U.S. benchmark, fell to a 17-month low. The price, $45.88/bbl, marks a stunning fall from a price that closed at $76.40/bbl on October 3rd. So, what has caused this roller coaster ride, and where are prices headed as we head into 2019? Let’s first review how to we got to sub-$50 oil as we near the end of 2018. That’s important, because I think it strongly influences what is likely to happen in 2019. In my 2018 predictions, which I will grade in a couple of weeks, I projected that oil prices would reach $70/bbl in 2018. The price of WTI, the U.S. benchmark, rose to that level in May and remained there for most of the summer. There were several reasons I expected oil prices to rise. The threat of sanctions on Iran, global demand that continues to rise (despite increasing predictions of the demise of demand growth), and the deteriorating situation in Venezuela were just three of the reasons I predicted higher oil prices. But if you had asked me in mid-summer what I expected for the rest of 2018, I would not have anticipated an oil price collapse. I largely attribute this decline to an unexpected variable in the oil markets that I call “The Trump Effect”. President Trump has done some good things for the oil industry, but he has a blind spot when it comes to oil prices. He has been vocal about the need to keep oil prices low, even as the U.S. becomes an increasingly important global oil producer. WTI has slid lower overnight following API’s surprise large crude build (and no equity pump) and was unable to hold gains after a bigger than expected gasoline build (and tiny crude draw) along with a production rebound to record highs. If U.S. crude output rises, it’s likely to see more inventory builds, according to Stewart Glickman, an energy equity analyst at CFRA Research. “The Permian has surprised to the upside over the last couple of months,” he says. Tiny crude draw (4th week in a row) but another Cushing build along with a rise in gasoline stocks took the edge off for the bulls. WTI hovered around $44.50 into the DOE print and was very modestly lower after…. U.S. oil prices at below $50 and now even below $45 a barrel could cause concerns about the debt levels of some energy companies, Nasdaq energy analyst Tamar Essner told CNBC on Wednesday. “Credit markets have held up a lot better than the energy equity markets right now, so that tells you that credit investors out there believe in the oil story much more so than energy equity investors do right now,” Essner said. Consumers in the U.S. like the low gasoline prices that come with lower oil prices, but a slide in the price of oil has a broader impact on the economy, Essner said. Some of the newer U.S. shale producers are probably deep into cash-flow negative at the current oil prices of $43 a barrel WTI Crude, although the energy industry as a whole is “in a lot stronger position” today than it was in the price crash of 2014, according to the energy analyst. “A lot of the debt has been put in a much more consolidated position. We’ve just had a round of credit redetermination in the fall when prices were higher, so that should buy us some time in the market as well,” Essner said, referring to the banks’ twice-yearly borrowing base redetermination of energy companies. Over the past few weeks, when oil prices were falling due to fears that the OPEC+ production cuts won’t be enough to rebalance the oil market, some companies announced their 2019 capital budget plans. Many of those companies said they would be cutting spending and the number of rigs, Essner said, noting that lower spending levels will ultimately result in a lower pace of oil production growth, but it will take time. Can the U.S. shale boom continue if WTI stays mired below $50 per barrel? Much has been made about the dramatic cost reductions that shale drillers have implemented over the past few years, with impressive breakeven prices that should ensure the drilling frenzy continues no matter where oil prices go. On earnings calls with investors and analysts, shale executives repeatedly trumpeted extremely low breakeven prices. However, those figures are at times cherry-picked or otherwise misleading. They fail to include the cost of land acquisition and other costs, or they simply reflect cost structures in only the very best acreage. The sudden meltdown in prices – oil fell nearly 8 percent on Tuesday – could put renewed scrutiny on the point at which many shale wells breakeven. The problem for a lot of companies is that they are not necessarily earning the full WTI price. Oil in West Texas in the Permian Basin continues to trade at a steep discount relative to WTI, even as the differential has narrowed in recent months. With WTI at roughly $47 or $48 per barrel, oil based in Midland is trading below $40 per barrel, the lowest point in more than two years, according to Bloomberg. Bloomberg NEF data provides more clues into the complex “breakeven” debate. Wells located in the Spraberry (within the Permian basin) can breakeven when prices trade between $32 and $47 per barrel. Digging deeper, Bloomberg NEF notes that some of the best wells can break even in the low $30s, but the worst quartile of wells breakeven at an average of $65.54 per barrel. In other words, a large portion of wells in the Permian – which, to be clear, is often held up as the best shale basin in the world – is currently unprofitable, given WTI priced in the high-$40s per barrel. Oil prices crashed to new one-year lows on Tuesday, dragged down by a deepening sense of global economic gloom as well as fears of oversupply in the oil market itself. The reasons for the sudden meltdown were multiple. Rising crude oil inventories and expected increases in shale production weighed on oil prices, but the price crash was accentuated by the broader selloff in financials. Crude prices fell 4 percent on Monday and about 7 percent on Tuesday. WTI dropped below $47 per barrel and Brent fell to the $56 handle. The EIA said in its latest Drilling Productivity Report that it expects U.S. shale production to top 8.1 million barrels per day (mb/d) in January, rising by a massive 134,000 bpd month-on-month. The Permian alone will see production rise by 73,000 bpd next month. By way of context, the gains in the Permian are bigger than even some of the large monthly declines that we have seen in Venezuela, for instance.